What is an image guided facet joint corticosteroid injection? The spine is made up of bones called vertebrae. At the front of the spine is solid bone, and at the back there is a bony canal, or channel. The solid bone is separated from the next bone by a disc. One vertebra is connected to the next vertebra at the back in the bony canal by pairs of facet joints on the right and left sides of the spine (see diagram). These joints allow forward and backward bending, as well as side-to-side rotation. The joints also prevent one vertebra from slipping over the other. An image guided facet joint corticosteroid injection involves a radiologist (specialist doctor) using either X-ray guidance or a computed tomography (CT) scanner to guide the injection of a thin needle containing corticosteroid (or ‘steroid’) into one of these facet joints. The injections are designed to decrease inflammation in the facet joint and will often reduce pain. Arthritis of the facet joint or strain of the joint from bending and twisting may lead to back pain in the area of the arthritic facet joint, muscle spasm and dull pain in the buttock, hip, groin or upper leg. Clinical examination may suggest that the facet joint is the cause or one cause of the pain symptoms. An injection of corticosteroid into the facet joint may alleviate the pain by reducing inflammation of the joint. If the pain is suspected to come from a particular joint, but it is not certain which one (especially in older people who may have arthritis at a number of spinal levels), blocking the joint with anaesthetic confirms or rules out that particular joint as the cause. This can help planning for future surgery. If surgery is a consideration, facet joint corticosteroid injection may be used to relieve the pain before the surgery and can sometimes allow surgery to be delayed or avoided. How do I prepare for an image guided facet joint corticosteroid injection? Because you will be lying on your stomach during the procedure and will be uncomfortable if your stomach is too full, it is advisable to limit food intake to a light meal only, up to 2 hours before the procedure.You should wear comfortable clothes that are easy to remove and leave jewellery at home, especially necklaces. Please note that some of the disinfectant agents used during these procedures may stain light-coloured clothing. When you make your appointment for the facet joint injection, you need to let the radiology clinic or department know if you are taking any blood thinning medication, such as warfarin, clopidogrel, dabigatran, prasugrel, dipyridamole or asasantin (for more information about these medications, go to NPS: www.nps.org.au/medicines). What happens during an image guided facet joint corticosteroid injection? You may be asked to change into a hospital gown, depending on the area of the joint to be injected. You will be helped onto an X-ray or a CT scanner table on a thin plastic mattress. If the injection is X-ray guided, you will be on your stomach with one side of the body raised if the injection is in the lower back. For neck joints, you may be on your stomach or back. For CT guided injections, you will be placed on your stomach for lower back injection, and on your back or stomach for neck joint injections. If X-ray guidance is being used, the skin is marked with ink over the joint to be injected. If CT guidance is being used, plastic tape with small metal markers attached to it will be taped onto your neck or back. The area of the skin is cleaned with an antiseptic solution, and local anaesthetic injected into the skin and deeper tissues. This is usually the most uncomfortable part, with a sharp pin prick followed by stinging. You will be awake and only the area where the facet joint injection is being carried out will be numb. Through this numb skin, a thin needle is guided into the joint and a combination of long acting local anaesthetic and corticosteroid is injected. This may produce a dull ache for a few seconds. Are there any after effects of an image guided facet joint corticosteroid injection? The area around the joint is expanded during the injection. This may irritate the joint further and the symptoms may be aggravated for a day or so before the steroid starts having its effect. Occasionally, numbness or weakness lasting a few hours will occur in the arm or leg on the same side as the injection. How long does an image guided facet joint corticosteroid injection take? The procedure itself usually takes approximately 15 minutes. What are the risks of an image guided facet joint corticosteroid injection? This is a very safe procedure and lower risk than both image guided epidural corticosteroid steroid injection and image guided nerve root corticosteroid injection. Allergy to the local anaesthetic may produce itching and hives or, rarely, a more severe allergic reaction, as with an allergy to any medication. Reaction to the corticosteroid is relatively common, and produces redness and flushing of the face and body, usually starting a few hours or the day after the procedure and lasting a few days, the so called ‘cortisone flare’. Allergy to corticosteroid ranging from a mild rash to anaphylaxis (breathing problems and low blood pressure) is very rare, occurring in fewer than 1 in 250,000 patients. A numb arm(s) or leg(s) may result if the anaesthetic mixed with the steroid leaks into the adjacent epidural space. This lasts an hour or so in most people and is also uncommon. Worsening pain beyond 5–7 days after your procedure. Persistent or new weakness or numbness in your arm(s) and/or legs (if your injection was in the neck). Persistent or new weakness or numbness in your leg(s) (if your injection was in the lower back). Loss of control of bladder or bowel function. Bleeding into the joint is very uncommon, and usually requires no active treatment and can be managed with pain medication and follow up with your local doctor. Joint infection is also extremely rare, but is potentially very serious. It usually requires treatment with antibiotics. In very severe cases, an operation may be needed to remove the infected tissue, as well as a stay in hospital for antibiotics given intravenously (directly into a vein). What are the benefits of an image guided facet joint corticosteroid injection? 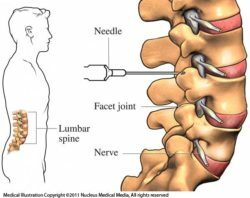 Relief of pain from facet joint injection in a patient with pain of undetermined cause is a strong indicator of facet joint related pain. This aids in management in organising appropriate physiotherapy and posture correction therapy. Acute facet pain is very rapidly relieved and this relief may be long term, with approximately 80% of patients experiencing relief for 3 months or more. Chronic facet joint related pain may be relieved for weeks to months. Identifying that a facet joint injection has provided relief from pain is a necessary first step for patients who are potential candidates for radiofrequency facet joint nerve blocks. Who does the image guided facet joint corticosteroid injection? The procedure is usually performed by radiologists (specialist doctors) and sometimes by pain-management specialists. The doctor carrying out the procedure needs to be appropriately trained and experienced in image guided facet joint corticosteroid injections using CT imaging. CT guided needle placement is considered to be the most accurate technique. Where is an image guided facet joint corticosteroid injection done? The procedure is carried out in a radiology practice with access to a CT and/or fluoroscopy X-ray facility, an angiography suite in a hospital or an operating theatre with good mobile fluoroscopy facilities. When can I expect the results of my image guided facet joint corticosteroid injection? The results of the procedure are made available either before the patient leaves, delivered to the patient’s doctor in the next day or two or the patient may elect to come back at their convenience to collect the report and X-ray or CT images. The patients are usually provided with a pain chart to record the response to the injection over the next few weeks. If they are not provided with a chart, they should keep a diary as a record of the response or otherwise. Page last modified on 31/7/2017.